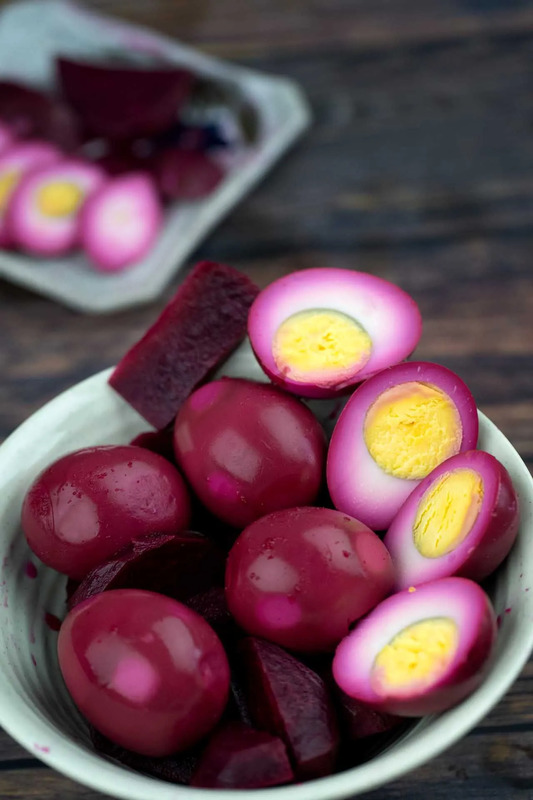 I learned this pickled eggs recipe from a coworker years ago, but the first hand experience came about on a weekend a month ago, when my 9-year-old niece decided she would only eat pink foods from then on. And wear only pink clothes, of course, with the exception of her all time favorite turquoise Elsa dress. Because it just happened that I was her very dear aunt, and I was visiting them when the announcement was made, the responsibility was automatically assumed mine. Ain’t I a food blogger, after all? We did manage to get pink everything. For a while. Strawberry bread. Bacon. Red radish sprouts. Red dragon fruits. She didn’t mind the shade variety and seemed tolerant of the black seeds, thankfully. Then came day 2 and she decided she missed her hard boiled eggs. Except they’re not pink. I knew then I was going to become her hero. First thing first, are pickled eggs bad for you? With boiled eggs, beetroots, vinegar and sugar as the ingredients, this pickled egg recipe is pretty healthy. With the absorbed sugar, each egg contains only 137 calories, and is a good source of protein with 6.8 gram. Cholesterol is the same as the amount in an ordinary egg, about 186 mg, or 62% of your daily allowance. There’s been a pass from scientists for healthy people to eat up to 3 eggs a day, so one of these pickled eggs per day should not give you any health concerns. How do you make your own pickled eggs? First, you boil the eggs, peel them, and place them into a jar. Create a mixture of beets, vinegar, sugar, water and cinnamon and bring to a boil. Pour this mixture over the eggs and let chill for 4 hours. Voilà! You now have beautiful pinky pickled egg! Can you put hard boiled eggs in pickle juice? Yes you can. If it’s tepid juice, however, you will have to let the eggs sit for a while longer than 4 hours for the juice to be fully absorbed into the egg white. You can also reuse the pickle juice once if the previous batch is finished within a week. Note that using the same pickle juice for more than 2 weeks might be dangerous, as there is less vinegar in the used juice to protect it from germ infection. The second-hand juice also degenerates faster due to previous exposure to the air. How long do you have to let pickled eggs sit? The eggs need at least about 4 – 6 hours to absorb the “seasoning” from hot pickle juice. If you make them in the evening, leaving them to chill overnight is the best way to make sure they get the desired pink color. Do pickled eggs need to be kept in the fridge? Vinegar in the pickle juice can act as a natural preservative to keep the eggs for about 7 – 10 days in cool weather. Fridging the eggs can help prolong the lifespan to up to 3 weeks. In fact, I saved one of the pickled eggs that I made for the niece to check how long it could really go. One month in and there’s no noticeable foul smell yet – the vinegar seems to be doing a great job. It’s not my advice to make a big jar of these and keep them for more than 20 days though – these eggs are so easy and quick to make that the time saved wouldn’t be worth the risks if they get spoilt. What do the eggs taste like? The taste is a combination of the sweetness of beet and sugar, and the tanginess of vinegar. I have to admit I’m not the biggest fan of anything beet – both the smell and the color always come off too strong for my liking. Plus, eating a real egg that’s sweet is just…off (chocolate eggs are totally fine!). So needless to say, I didn’t even finish one of the eggs we made. My niece and nephew, however, were totally into them. The sliced eggs effortlessly made it to the list of their favorite things to eat during the 3-day-pink-diet (her pink crave pretty much, thankfully, subsided after the second day), so I guess it’s not a failure after all. It takes only 30 minutes to prepare the eggs and the juice, with ingredients easily available in any supermarket. Place the beet in a pot. Pour 1 ½ cup water in so the beet are fully submerged. Cover the pot, turn on the cooker and bring to a full boil. Keep cooking for another 12 minutes, or until the beet is soft. Add vinegar, sugar, and cinnamon. Bring to a boil again and immediately turn off the cooker. Put the eggs into a glass jar. Pour the juice over to submerge. Cover and chill for about 4 hours before putting the jar into the fridge. Wow, these eggs are absolutely stunning. I’ve made beet pickled eggs, but not for a while. Now I’m in the mood. You’ve achieved such a deep color. I love it. I was surprised at this color also, that was somehow a success to me. Hope you are going to have a good one soon! Maaan! Everyone of y’all that has a recipe up here for pickled eggs make this process so complicated. Just buy a bunch of jars or cans of pickled beets. Collect the pickled beet brine/juice from the can/jars in Mason jars Boyle your eggs, peel them and let them sit in the pickled beet brine/juice for arnd 3 days. THAT is the easy way to make pickled eggs.without the fuss.